The “Get Crackin” tag line you know, but the “Pistachios” headline gets amplified with a “Wonderful” trademarked “Eyebrow” and a “Crack a smile” Subhead. This Get Crackin’ Wonderful Pistachio Aisle Display is courtesy of the Pistachio industry cooperative. The vivid green is a good takeoff on this year’s green color themes, as well as cross tie to the green of Pistachios themselves. 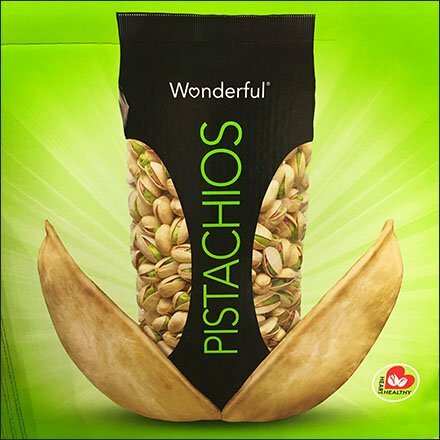 Browse this Get Crackin’ Wonderful Pistachio Aisle Display in the gallery of images.